President Museveni speaking at the launch of the Shs36b water project in Bugisu on Saturday. Photo by Agencies. MANAFWA: President Museveni has urged residents to embrace irrigation farming in order to increase crop production and food security. The President was speaking at the launch of a 200km gravity water scheme in Manafwa district on Saturday. “You can not only have this water for drinking, but it can be used for irrigation in your gardens because you don’t need a lot of money to channel water to boost your agriculture production,” Mr Museveni said. He urged the farmers to create channels and small trenches to divert the water to their gardens in order to ensure food security. 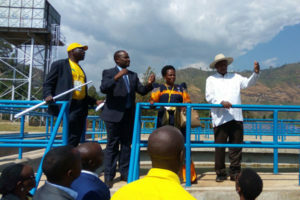 The President, who was accompanied by ministers, area Member of Parliament and district leaders, said the water scheme that has capacity to serve Manafwa, Namisindwa and Tororo districts, was one of the pledges he made long time ago. “We talked about having water here long time ago and people thought it was a joke, but now the water has been connected and this water serves 16 sub-counties and it will be extended to other areas facing water scarcity,” he said. The Shs36 billion scheme funded by government of Uganda in partnership with the African development bank has capacity of 1,296 cubic meters of treated water per day. The scheme has its source located in Soono village in Bukokha sub-county on river Lwakaka with over 900 connections, 387 in Tororo and 533 in Manafwa. The President also urged district leaders to mobilise the residents to ensure that they use the water for not only drinking but also for irrigation. Sam Cheptoris, the minister of Water and Environment, said residents should desist from vandalizing water pipes on the scheme. “The frequent bad habits of vandalizing pipes will derail the well-meaning intention of this project,” he said. Eng Joseph Eyatu, the commissioner Rural Water and Sanitation Department in the Ministry of Water and Environment, said the second phase of the project will cover the entire Manafwa and some parts of Mbale District.